It refills itself between injections via a plastic tube (included) attached to bottle. 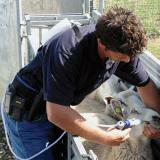 For vaccinating and drenching sheep, goats and small calves. 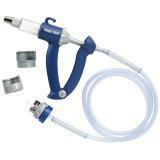 Sold as a syringe for vaccinating but you can add a drench nozzle (sold separately above) for drenching. Includes: gun, tube, 2 springs and 3 Uni-Lock draw-off assemblies that fit 50, 100, 200 and 250 ml bottle collars that will fit directly onto vaccine bottles. 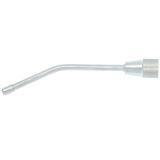 Drench nozzle: 4"L (sold separately above). Cylinder adjusts by 1/2 ml from 0 to 12.5 ml for accurate dosages. See instruction manual above. Can be used with a Backpack (sold separately) holds 1 liter. Also use our handy EzePak Belt & Holster when you need both hands to work an animal. Nozzles are not interchangeable between drenchers we offer. For livestock use only. A spare plastic bottle that will fit into the medicine bottle holder, which enables you to be hands free when treating animals. Purchasing my fourth drench gun. We run 120 doe goat herd, and it is a breeze worming them all the same afternoon with two people and a good working chute system. Because they are cheap compared to the competition, I always keep an extra on hand for parts or in case one breaks. They are easy to clean and maintain. Only issue I have ever had is an old doe grabbing onto the drench gun nozzle when I was pulling it out and it cracked the plastic tip where it connects. This completely breaks the gun because the check valves will not work properly when air can seep in the crack. This was after about 4 years of use and a lot of doses given. Well worth the money, and comparatively a well made affordable drench gun. I just took my last spare and used it to apply delouse topical treatment, which we had been using a old single dose hand drencher for. It really sped up productivity running two of them. I would hands down buy it again. The unit feels semi-disposable. It performed well the first time I used it, but there were a couple of glitches. The most important was that about halfway through drenching my lambs with Valbazen I noticed that the dosage had increased to 6 ML, enough for a 200-pound animal. Fortunately, Valbazen has a very high degree of safety, but who knows how many lambs received this overdose before I noticed it? The second was that the drench nozzle has a tendency to shift, requiring me to stop and adjust it quite a few times -- maybe every 10 lambs or so. I miss the old Syrvet drenchers, which were more rugged and durable than this, but my recent experience with two of them (purchased elsewhere) is that while they felt rugged they were in fact junk, which could fall apart after drenching as few as 100 lambs. I believe this unit will outperform the Syrvet, despite its shortcomings. The drench nozzle is over 5 inches long (cattle length) and no other sizes are available. That is far to long to properly drench adult goats let alone kids. After being frustrated with this product I purchased an Allflex drencher that has a 3.5 inch nozzle available (which you can shove all the way in on an adult animal) and had much better experience drenching my goats. Great for drenching sheep. Super fast delivery!! It's wonderful because it makes managing my sheep faster and less stressful for them and for the staff who do it. Even so I would like it to be more resistant to rough use.